Hi,all first of a million questions!! Having managed to get the engine in my new toy to turn over- pouring diesel into cylinders and rocking the car in gear over a week period, I am now not sure as to next step. Should I try to turn over on the battery/starter motor and or try to start the car , or should I know take the engine out and check it over first- it has been stood for 23 years and has done around 7k miles so I dont want to damage it. 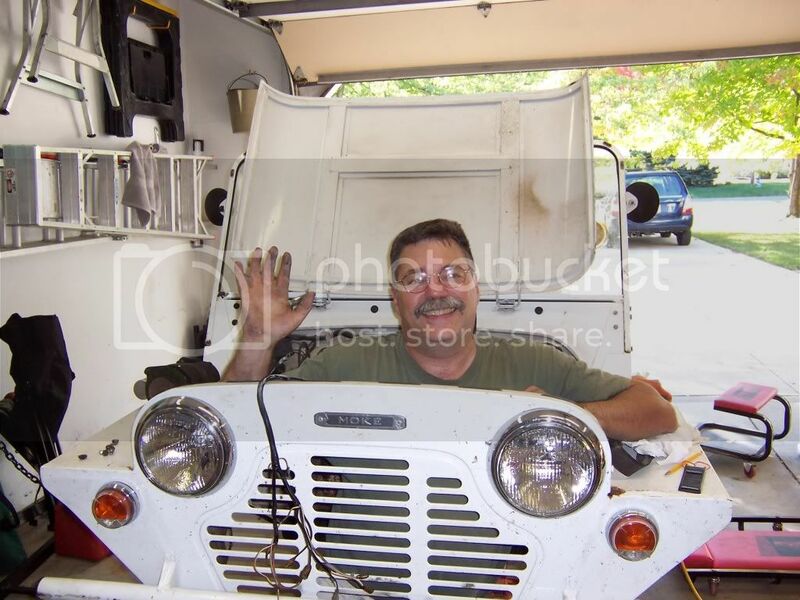 which with a fixed grill will be impossible?, also the radiator likewise... Is there a secret moke trick to doing this!! Finally for now , I would like to clean up the rear sub frame, is this relatively easy to remove? Me? As long as the engine turns freely, I would take a shot at starting it up. When you first started breaking it loose, either the rings freed up or broke up. This is Matt Jones Son of Robin. Last edited by Motor-Mouse on Sat Dec 14, 2013 21:36, edited 1 time in total. Not too many like yours! Most bite!! James - if you are going to start your engine, I'd suggest changing the oil and oil filter then winding it over until you get oil pressure up, then start it. That it was locked up after such a long storage period, I'd say as others here have that the rings were rusted to the bores, consequently, the bores will have a divit in them where the rings were and the face of the rings (at the very least) will be scuffed beyond usability. You've not much to loose from giving it a run, but I wouldn't get high hopes of it not being a smoker. You'll also find probably that the oil seals will have gone hard and won't seal too well. Well, at least I didn't get any Ned Flanders references. Thanks all, the cautious route was what I had in my head, but the old slap some fuel in and fire up was beckoning!! So I will take the risk free route and take the engine out and give it a once over... And anyway I need to get a photo poking out of the engine bay , mine will be Mr grumpy though! Natural expression for a Project Manager. j Beeton wrote: Thanks all, the cautious route was what I had in my head, but the old slap some fuel in and fire up was beckoning!! So I will take the risk free route and take the engine out and give it a once over... And anyway I need to get a photo poking out of the engine bay , mine will be Mr grumpy though! Natural expression for a Project Manager. hang on a minute. I am a project manager, and definitely no grumpy!! You might consider cleaning the carburettor jet and float chamber etc before you try starting it. Having a moking good time!